The poem The Boxer, is a modern poem about a prize fighter. 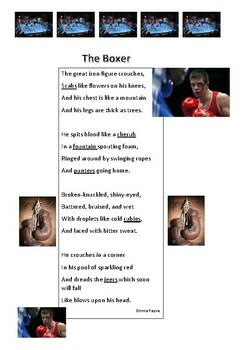 The poet, through her use of simple comparisons, enables students to not only visualise the defeated boxer, but also to feel sympathy and empathy for him. This product concentrates on the reading strategies of inference and visualising for students. 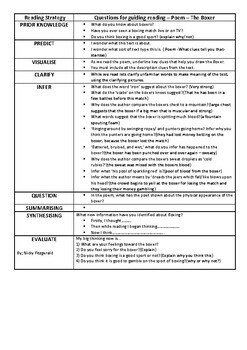 It also includes a teacher guiding questioning card to illicit guided responses for your students. Students have the opportunity to use the strategy of evaluation at the end, giving their opinion about the sport of boxing. I hope to get your feedback!